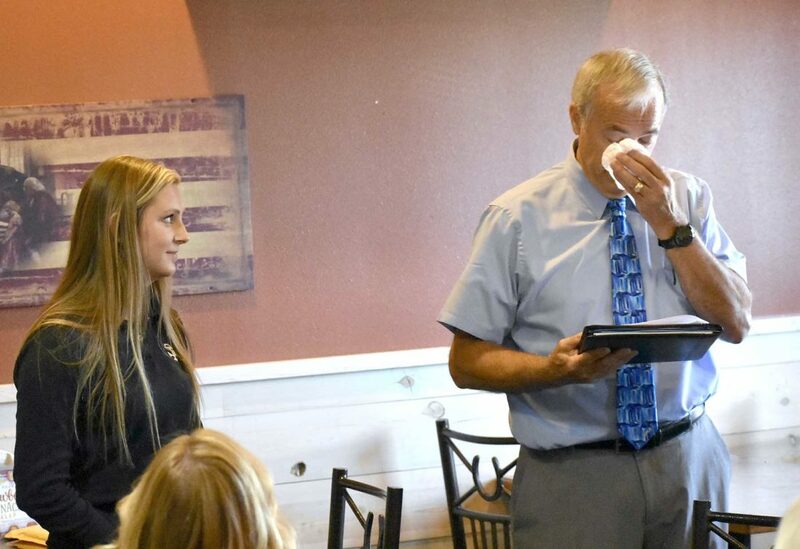 -Messenger photo by Chad Thompson Terry Moehnke, Noon Sertoma member, right, wipes a tear from his eye as he talks about the work Morgan Border has put in to raise awareness and funds for breast cancer Thursday afternoon at Pizza Ranch. Border looks on at left. 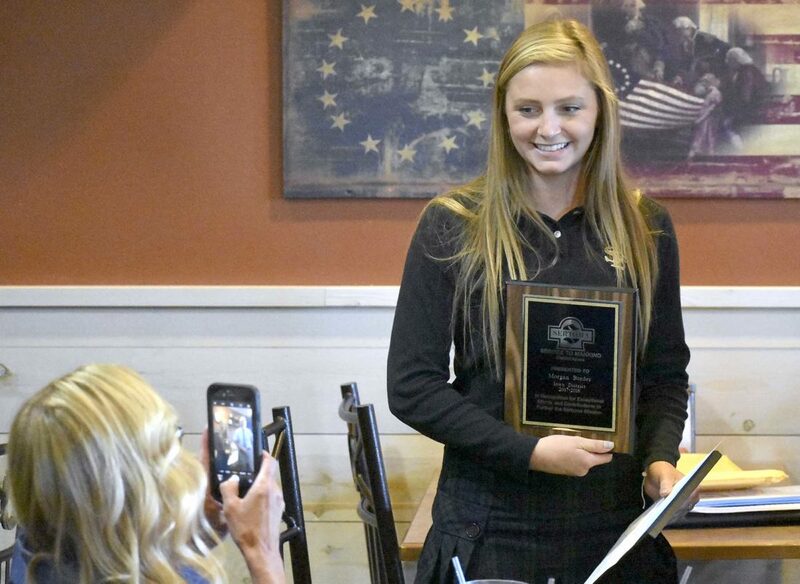 -Messenger photo by Chad Thompson Sheila Border, of Fort Dodge, at left, snaps a picture of her daughter, Morgan Border, 17, a junior at St. Edmond Catholic School, as she holds the Noon Sertoma Service to Mankind award during a meeting at Pizza Ranch Thursday afternoon. The award is the highest honor that can be given to a nonmember. A St. Edmond Catholic School student who organized an event for breast cancer awareness as a middle-schooler was surprised with an award for her efforts during the Fort Dodge Noon Sertoma Club’s meeting Thursday. Morgan Border, 17, who is now a junior in high school, was the recipient of the Noon Sertoma Club Service to Mankind award. It’s the highest honor the club gives out to nonmembers. Terry Moehnke, a member of Noon Sertoma, presented the award to her at Pizza Ranch. About 30 people were in attendance. “At an age where most children are content with playing with friends, Morgan Border has started and expanded a community activity that has donated thousands of dollars to our local cancer center and the American Cancer Society to assist those affected by breast cancer,” Moehnke said prior to presenting the award. Border started Stay-A-Breast in 2014. Stay-A-Breast brings swimmers together with breast cancer survivors to swim laps and raise money to support cancer research and treatment costs. The proceeds are split evenly between the Trinity Cancer Center and the American Cancer Society. Border said later that when she developed the idea for Stay-A-Breast, she wanted to do something that hadn’t been done before. She was surprised at the success it achieved. Moehnke said more than 60 people swam 2,000 laps the first year of the event. She was able to donate more than $8,000 to local agencies. 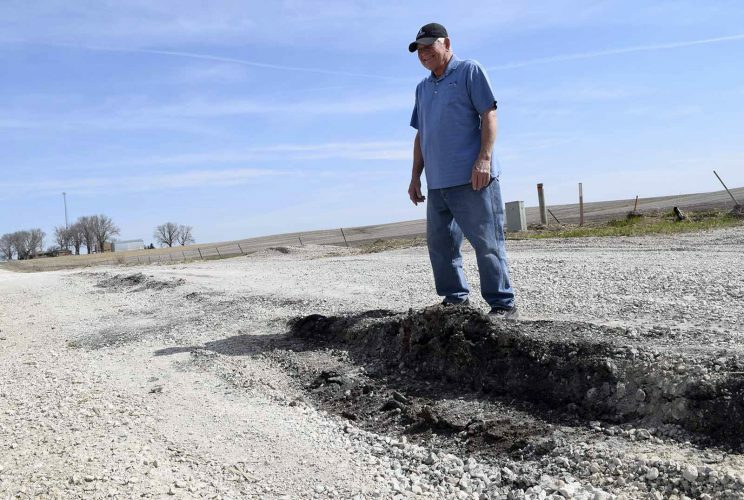 “She has continued to expand the program each year and has been able to involve football and swim team members from Iowa State University the last two years,” he said. According to Moehnke, more than $50,000 has been donated and distributed since she began the event. 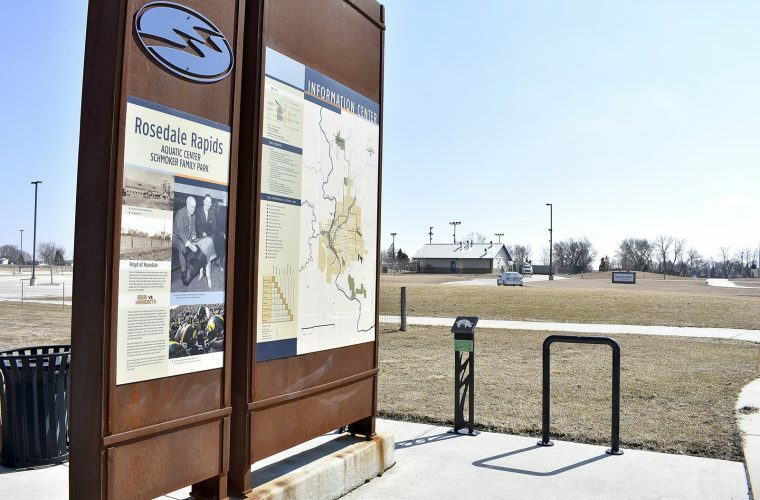 Moehnke recalled a time when Border spoke directly to Paul Rhoads about the project. Rhoads was the head football coach at Iowa State University at the time. Moehnke said Border’s leadership skills have evolved in recent years. Moehnke complimented Border for taking on the Stay-A-Breast project by herself. “Group efforts reduce the workload and brings us together as a service club,” he said. “Together the club members have learned to delegate tasks to reduce the burden on individual members, yet Morgan has tackled the daunting task of creating and managing an event by herself. She has been able to build awareness of a disease that affects many people and their families as well as providing funds that aid with transportation costs, insurance copays and gas cards during what can be the worst experience of their lives, she has affected unknown numbers of lives. She does it because she thinks it is fun, but surely there is more to her motivation than that. Border thanked those in attendance for their support.